The scalp refers to the layers of skin and subcutaneous tissue that cover the bones of cranial vault. In this article, we shall look at the anatomy of the scalp – its layers, neurovascular supply, and any clinical correlations. The scalp consists of five layers. The first three layers are tightly bound together, and move as a unit. 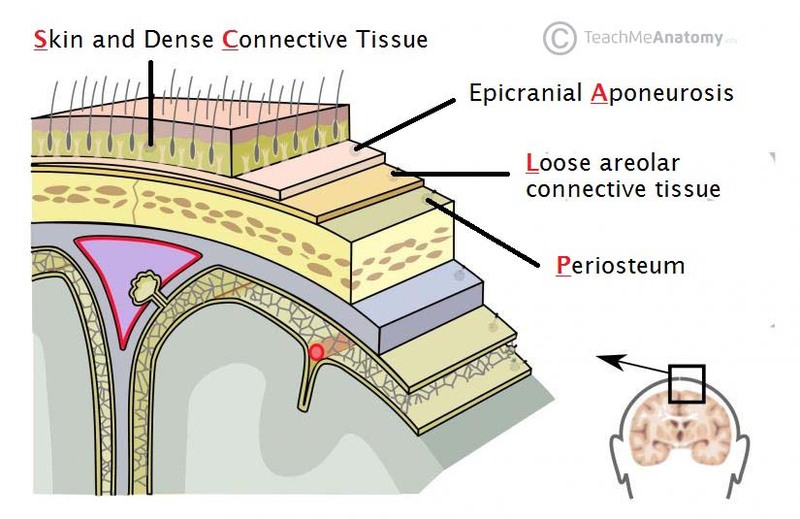 The mnemonic ‘SCALP’ can be a useful way to remember the layers of the scalp: Skin, Dense Connective Tissue, Epicranial Aponeurosis, Loose Areolar Connective Tissue and Periosteum. Skin – contains numerous hair follicles and sebaceous glands (thus a common site for sebaceous cysts). Dense Connective tissue – connects the skin to the epicranial aponeurosis. It is richly vascularised and innervated. The blood vessels within the layer are highly adherent to the connective tissue. This renders them unable to constrict fully if lacerated – and so the scalp can be a site of profuse bleeding. Epicranial Aponeurosis – a thin, tendon-like structure that connects the occipitalis and frontalis muscles. Loose Areolar Connective Tissue – a thin connective tissue layer that separates the periosteum of the skull from the epicranial aponeurosis. 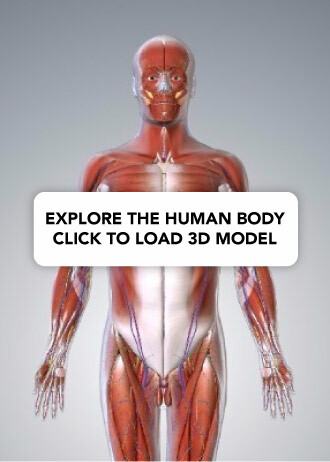 It contains numerous blood vessels, including emissary veins which connect the veins of the scalp to the diploic veins and intracranial venous sinuses. Periosteum – the outer layer of the skull bones. It becomes continuous with the endosteum at the suture lines. Figure 1.0. The five layers of the scalp. Note – The three layers below the periosteum are the meninges. The ‘danger area of the scalp’ is the area of loose connective tissue. This is because pus and blood spread easily within it, and can pass into the cranial cavity along the emissary veins. Therefore infection can spread from the scalp to the meninges, which could lead to meningitis. Posterior auricular – supplies the area superiorly and posteriorly to the auricle. Anteriorly and superiorly, the scalp receives additional supply from two branches of the ophthalmic artery – the supraorbital and supratrochlear arteries. These vessels accompany the supraorbital and supratrochlear nerves respectively. Fig 1.1 – Three key arterial branches supplying the scalp. 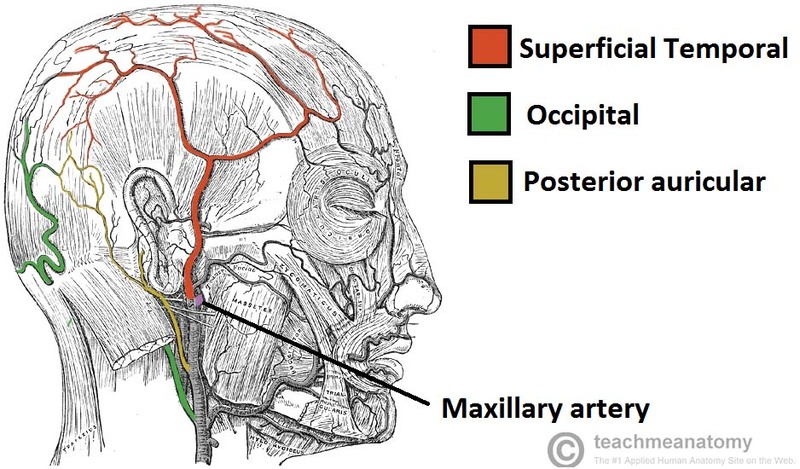 Note, the maxillary artery supplies the deep structures of the face, not the scalp. The venous drainage of the scalp can be divided into superficial and deep components. The superficial drainage follows the arteries above; the superficial temporal, occipital, posterior auricular, supraorbital and supratrochlear veins. The deep (temporal) region of the skull is drained by the pterygoid venous plexus. This is a large plexus of veins situated between the temporalis and lateral pterygoid muscles, and drains into the maxillary vein. Importantly, the veins of the scalp connect to the diploic veins of the skull via valveless emissary veins. This establishes a connection between the scalp and the dural venous sinuses. The scalp receives cutaneous innervation from six main nerves, which arise from the trigeminal nerve or the cervical nerves. Supratrochlear nerve – branch of the ophthalmic nerve which supplies the anteromedial forehead. Supraorbital nerve – branch of the ophthalmic nerve which supplies a large portion of the scalp between the anterolateral forehead and the vertex. Zygomaticotemporal nerve – branch of the maxillary nerve, this supplies the temple. Auriculotemporal nerve – branch of the mandibular nerve which supplies skin anterosuperior to the auricle. Greater occipital nerve – derived from the posterior ramus (division) of C2, and supplies the skin of the occipital region. Great auricular nerve – derived from the anterior rami of C2 and C3, and supplies the skin posterior to the ear and over the angle of the mandible. Third occipital nerve – derived from the posterior ramus of C3, and supplies the skin of the inferior occipital region. The pull of the occipitofrontalis muscle prevents the closure of the bleeding vessel and surrounding skin. The blood vessels to the scalp are adhered to dense connective tissue, preventing the vasoconstriction that normally occurs in response to damage. The blood supply to the scalp is made up of many anastomoses, which contribute to profuse bleeding. What is the most internal layer of the scalp? In a scalp laceration, the resting tone of which muscle inhibits closure of the bleeding vessel and surrounding skin? Which nerve provides innervation to the area of scalp behind the ear?